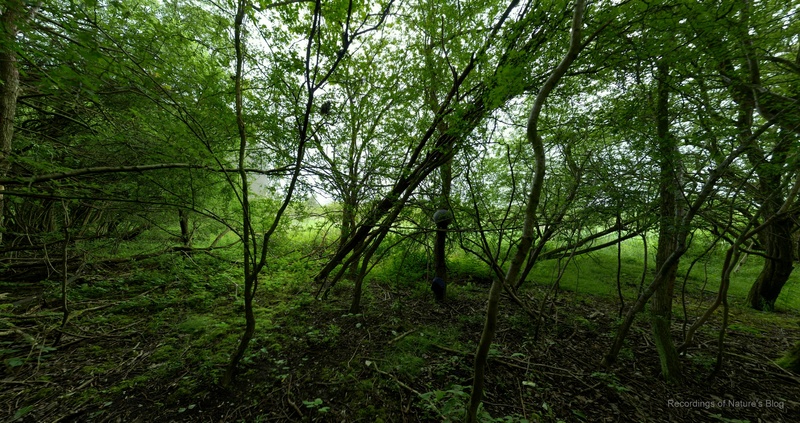 This is an all-night audio field recording from Jægersborg Dyrehave, north of Copenhagen, 28-29th May 2017. 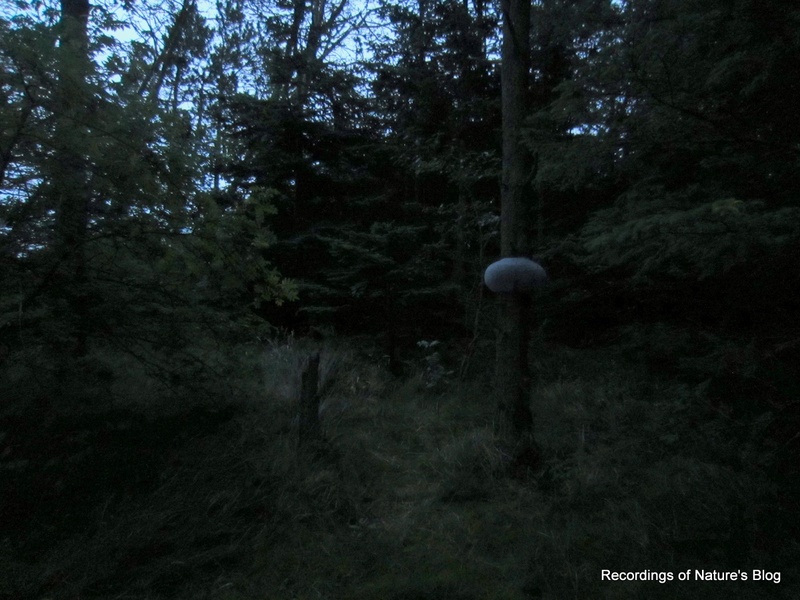 So, this time I managed to do a night recording in a forest a bit further away than my local Brøndbyskov. Jærgersborg Dyrehave is a much older and larger woodland (royal deer garden), know for a large population of old oak trees, Eremitageslottet and just plenty of deer. For a long time, I have been curious to know more about the night sounds of this old historic forest. It is just a great time of the year, everything so fresh and green with tense smells of moist soil and vegetation. These few weeks of the year with such a high activity among birds, mammals, plants and insects, I think it could also be called it a stressful time of the year. It was a calm night with warm temperatures 18-12C. Recent days had been full summer days with temperatures >23C, dry and lots of sun. 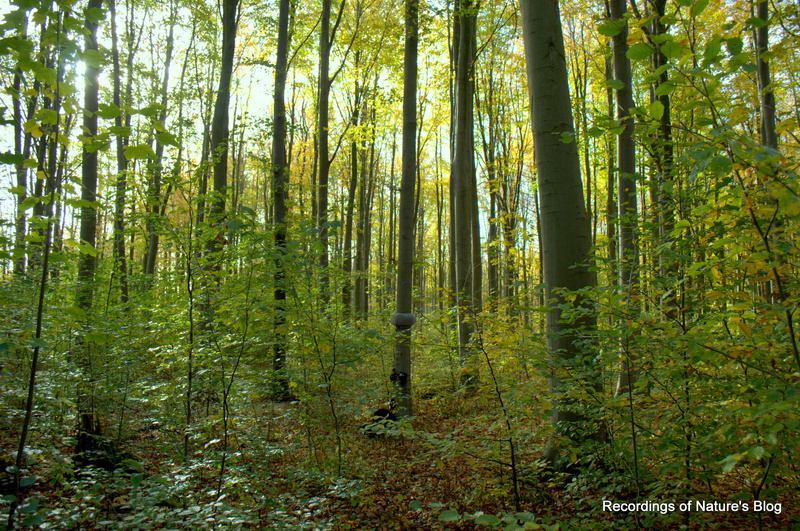 For the recording, I found a place some distance away from the paths, with tree trunk suitable for my tree ears microphone setup. Just past midnight, the deep noise from the amusement park (Bakken) is still clearly heard, but declining. Generally quiet night ambience, still somehow affected by (partying) humans. At this time, there footsteps of deer walking around nearby. About 6 and 8! minutes into the clip, out of the silence there is a sudden very loud screaming (warning loud !) of some sort of animal, very close. Does anyone know what species this is and why it is screaming? I am far from having any clue, just think it sounds more like a mammal than a bird. The clip starts 2:50 am. Now the noise from Bakken is gone and the traffic noise is also at a minimum, all in all making this period a very undisturbed silent night ambience. 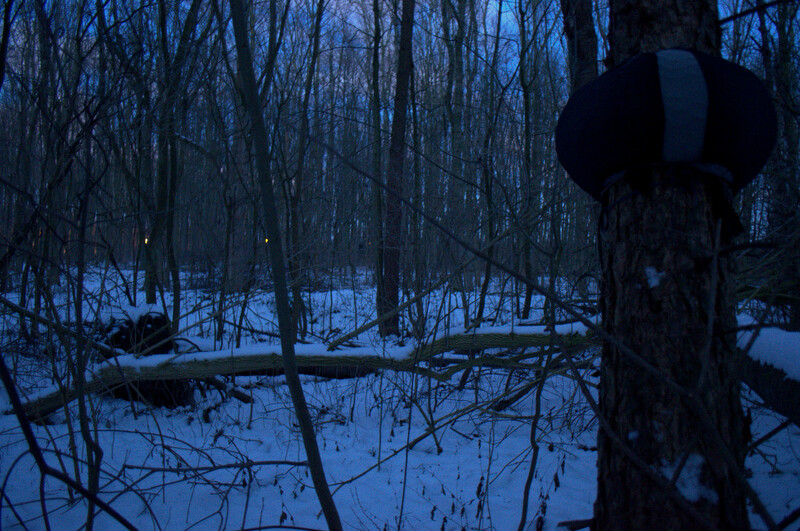 Occasionally, you can hear a woodcock and an owl-like call. However the first light is emerging and15 minutes into the clip the first robin decide to start the day with quiet singing. After 10 minutes the song thrush joins in with a beautiful soft song, and now the whole forest is clearly waking up. At 1:00 there is some unusual bird song. I think it appears to be a Black bird, that suddenly changes its song into a funny exotic melody. Maybe a black birds that was raised amongst parrots? Never heard that song before. Anyone heard that before? The bird song is peaking at this time. The main voices of the morning chorus are wood warbler, black cap, black bird, song thrush, wren and robin. Nature audio recording of the quiet and calm atmosphere on a winter day in January, Borrevejle Vig, Roskilde fjord. January 14 2017. The recording starts at about 2 pm, duration 78 minutes. Partly sunny , westerly wind and about 3C. Wide angle view from the recorder. Click for (much) larger version. The surrounding reed beds give a relaxing whispering hiss, but otherwise this recording serves to give a picture of the overall silent winter landscape. I think it will be in clear contrast to how it will be in a few months time. Listen in headphones. With some effort, though, it is possible to hear various water fowl on the water, mostly at a distance. I think some gees and swans. The water is overall ice free. And then of course the motorway to the right in the bottom of the fjord and air planes that come and go with deep rumbling. 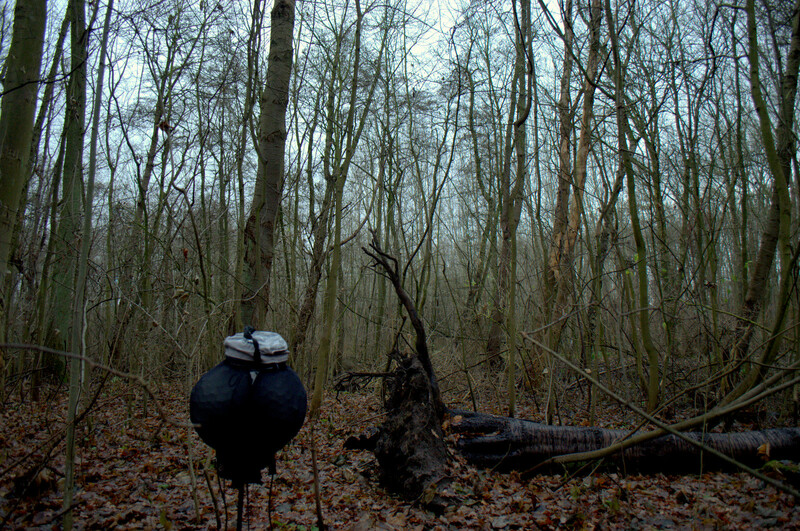 Audio nature recording from the winter forest of December 25th 2016, Brøndbyskoven. Recording starts around 9 am. Temperature 4C and barely no wind, rain slowly setting in. 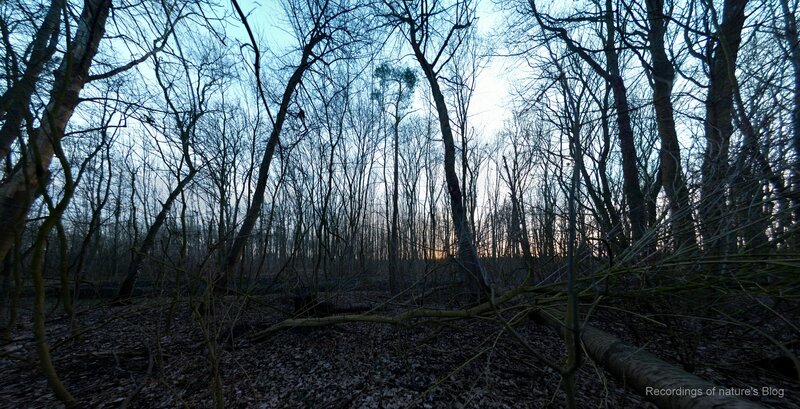 The forest is now leafless, greyish and transparent. Sounds are dominated by more distant sources, including church bells from Brøndbyøster kirke (400 m) and motorway noise (1.5 km), but also flocks of small birds and crows calling to each other can be heard from time to time. In the beginning you hear me walk away. Here in Denmark, Christmas (juleaften) is celebrated on the evening of the 24th, with church, rice porridge, pork roast/duck, Christmas tree and presents. The 25th is mostly a day for good relaxing and maybe a walk in the forest. This is an audio field recording October 29th in Brøndbyskoven on a sunny and pretty windy afternoon, about 10C, winds from NW. View from the recorder. Looking at the images the magnitude of wind rustling noise is surprising, and it also appears stronger on the recording than I remember it from the field. But is must be fairly correct, and the recording has not been processed in any way. Listen in headphones. 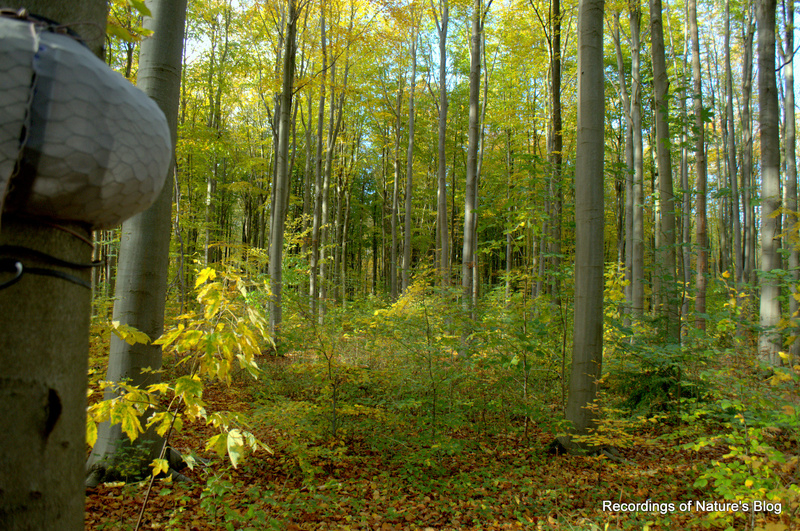 The trees still have plenty of leaves and the forest now stands beautifully yellow and green. The canopy is however rapidly thinning out. Now is really the time to enjoy these beautiful autumn colors, and watch the forest’s fascinating transformation from magnificent shadowy green halls into transparent open areas. The forest still has the sound of rustling leaves, but soon this will also be gone with hardly any sound from the wind, only leaving the traffic and other distant noises even more present. It would be all dull, if not for the fresh layer of yellow crisp leafs on the ground, which also makes a great sound when walking through it. 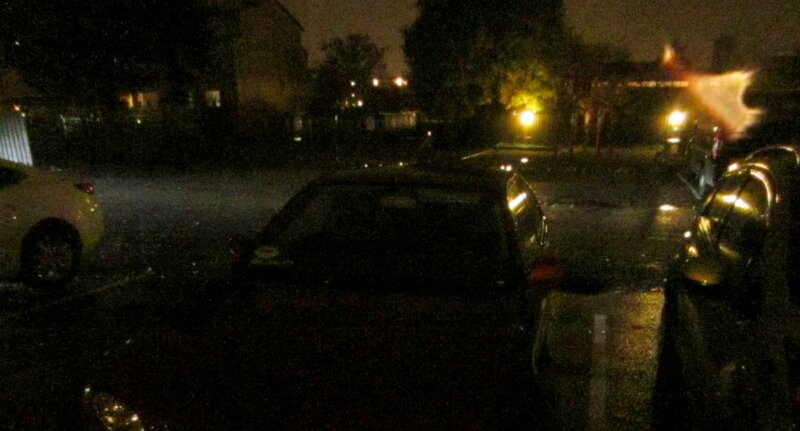 This is a simple recording of the sound of rain from inside a car. Late evening, October 19th 2016, approx 9 C. Nothing special, just this subtle monotonous sound with varying intensity, which to me evokes some sleepy moods.